Just say bah humbug, but I never got into the Christmas spirit last year. I’m grateful for the powerful significance of Christmas, for the gesture of Christ’s birth and the hope it still means to the world. So know that I’m talking more about the general holly-jolly festivity of it all. The stuff of cinnamon and evergeen and red glitter and snowy frosting. Now that I’m a wife and mom, my role in Christmas has changed significantly. But that’s just a really diplomatic way of saying there’s a long list of things to do spinning on a conveyor belt in my mind. I’m determined that’s not how it’s going to go down this year! To prepare, I’m busting out the Christmas tunes early and playing my movie favorites like Love Actually, The Family Stone, While You Were Sleeping, and The Family Man. I’m pretty sure this equates to blasphemy here on InspyRomance, but I’m usually much more of a Christmas movie kind of girl. Most books just don’t do it for me when it comes to Christmas. But let me tell you about this novella I absolutely devoured. It was like a little gift for myself I got free just for signing up for my friend Jessica Patch’s newsletter! 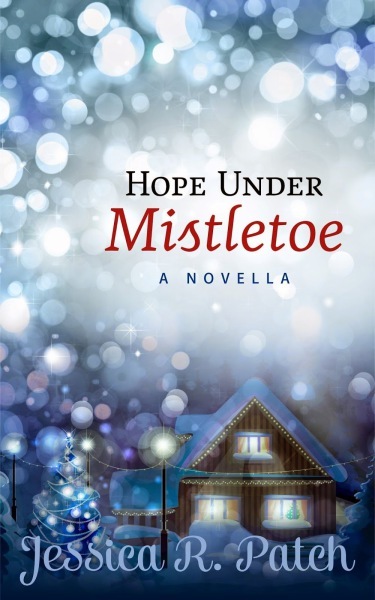 It has the charm of a snow-covered small town, a romance with the spice of a peppermint stick (if you read it, you’ll know exactly what I mean), and the warmth of a community rallying together. The premise drew me in immediately, and the writing kept me engaged. Plus, I loved loved loved Knox, Eden, and the personalities of their community. The girl has a gift for character development. You can receive this novel FREE just by signing up for the author’s newsletter here. Also check out the Hope Under Mistletoe Pinterest board and meet the “cast” as well as stroll through the fictional town! What are your go-to Christmas books and movies that get you in the festivity of the season? Laurie Tomlinson is a wife and mom from Tulsa, Oklahoma. She is a member of My Book Therapy and the American Christian Fiction Writers and received the 2013 Genesis Award for Contemporary fiction. Her work is represented by Rachel Kent of Books & Such Literary. A self-professed bookworm, Laurie earned a degree in literature but bypassed the traditional education route to become a book publicist. In addition to writing contemporary romance, she enjoys cooking, singing with her church’s worship band, and going on adventures with her husband, daughter, and yellow Lab. She always has a good novel in her bag, usually tucked between the diapers.